South Wales West Liberal Democrat Assembly Member, Peter Black has written to the Welsh Government’s Business and Enterprise Minister, Edwina Hart seeking an explanation after a potential investment that would have brought 100 high value jobs to the Swansea area was lost following her decision to end a research-based funding scheme without proper consultation. Mr. Black has raised with the Minister reports in this morning’s press that the her decision to end European funding to University of Wales’ POWIS scholarships without putting any alternative scheme in place has led directly to a proposal to establish an IT development centre, which could have created up to 100 jobs in the Swansea area, being withdrawn. The Western Mail reports that New Zealand-based software development company Pingar had been planning to set up a Centre for Knowledge Engineering here, but that it is now likely to choose the east of England instead. John Beer, who was responsible for the project and who is himself a POWIS scholar is quoted as saying that there was a “lack of transparency” over the end of the POWIS scheme and that companies that had benefited from the project had learnt about its demise through the media rather than from government. In his letter, Mr. Black asks the Minister to outline what contact her officials have had with this company and what communication the Welsh Government had with companies benefiting from POWIS about the decision to end funding. He asks how the Minister reassured these companies about funding for future research? “From an outsider’s viewpoint it certainly seems to be the case that Mr. Beer’s suggestion that the future of collaboration has been wiped out in one fell swoop is correct,” said Mr. Black. “I am very concerned that the Swansea area is potentially losing one hundred much-needed high value jobs and I want to know what contact Welsh Government officials have had with this company to persuade them to change their mind. South Wales West Liberal Democrat Assembly Member, Peter Black has teamed up with the Energy Saving Trust on behalf of his constituents in Swansea, Neath, Port Talbot and Bridgend that the average home in Wales can save up to £280 a year by being energy efficient. He says that with the cost of energy bills on the rise there’s no better time than now for householders to take back control of their bills. He urged householders to take advantage of Energy Saving Week between 24th and 28th October 2011 to learn more about the options available to them. As people in Wales face ever increasing energy bills, Mr. Black was informed that everyday items such as TVs and computers are responsible for a staggering 34 per cent of the UK’s carbon production. He was shown a number of nifty gadgets which can make day-to-day life easier whilst helping to reduce bills. One such item was the Eco Kettle. If everybody in the UK switched to an Energy Saving Trust Recommended kettle, then £270million in electricity could be saved annually. He was told that other household swaps like switching traditional bulbs for new, energy efficient ones can also make a huge difference. Newer style Energy Saving Trust Recommended bulbs last ten times longer than their predecessor and cost just £2 each, meaning a substantial saving of between £45 and £70 over its lifetime. Duncan McCombie, Energy Saving Trust director of operations for Wales, said: “It’s been a pleasure to team up with Peter Black for Energy Saving Week. Mr. Black added: “We are all responsible for contributing to reducing Wales’ carbon footprint. The cash savings that could go hand in hand with cutting energy use in households, means in these economic times, that there’s never been a more prudent time to take up these tips. Speaking at the his party’s autumn conference in Wrexham, Mr. Black said too many people are struggling to get a home of their own. “The House Builders Federation estimates that there are 100,000 Welsh families on housing waiting lists, with first-time buyers needing an average deposit of around £30,000. The Welsh Government’s response has been pitiful. Frank Little writes: One of the benefits of belonging to a party which is in power, albeit only in coalition, is that one gets to question ministers of the crown. 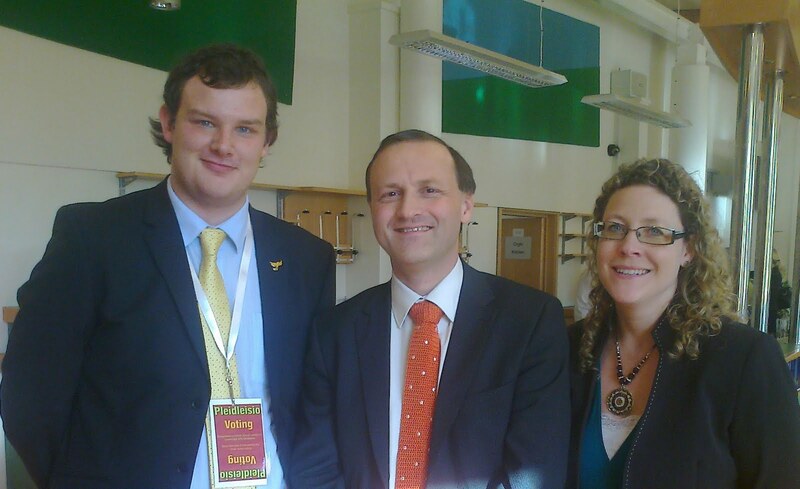 On Saturday in Wrexham, Steve Webb, Liberal Democrat MP and pensions minister in the DWP, joined two officers of care organisations on a panel to be quizzed by Liberal Democrat conference representatives. Being a LibDem gathering, there were rather fewer soft questions than one would expect at a Labour or Conservative rally, but Steve dealt efficiently with everything that was thrown at him, as one would expect from an expert in the field of pensions. On public sector pensions, he said that there was no alternative to renegotiating the funding of local authority schemes because of promises which had been made causing the schemes to be unsustainable on the present funding formula. The only alternative to a new settlement was massive taxation. He described the previous settlement under Gordon Brown's administration as "a cop-out". He emphasised that, even under the coalition government's proposals, local authority workers would still have pension provision better than most of the private sector. 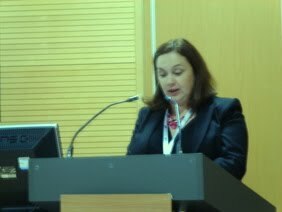 At the autumn conference of the Welsh Liberal Democrats held in Wrexham last weekend, a topical motion proposed by Eluned Parrott AM on behalf of the Vale of Glamorgan party called for a pause in preparations for shale gas exploitation in Wales. She pointed out that the technical briefing on mineral extraction made available to planning authorities was out-of-date, since it did not cover the technique of hydraulic fracturing. Speakers drew attention to the probable contamination of ground water and seismic events which have been attributed to hydraulic fracturing in parts of the United States. Cllr Frank Little stressed that action was overdue, since applications for exploratory drilling were pending, or had been granted, in many parts of South Wales. Liberal International reports that Det Radikale Ventre, a Danish founding member of LI, has received 6 Ministerial portfolios in the new three-party coalition government. They garnered 9.5% of the votes (up from 5.1%) and 17 seats in the parliament. The party leader Margrethe Vestager will become Minister of Economy and Home Affairs. “We must show that we will definitely enter, participate and contribute to European cooperation”, said Mrs. Vestager, asserting that DRV will ensure that Danish politics embodies a clearly liberal and internationalist direction. Among the six ministers is the country's first foreign born cabinet minister, Manu Sareen (originally from India), who has been given the Ecclesiastical and Equality Ministry. The new Danish government announced its agenda in which they will ease strict immigration rules and scrap a “points-based system” which is used to determine immigration eligibility. LI's other Danish member Venstre, led by former Prime Minister Lars Løkke Rasmussen, also managed to increase their seat count to 47, receiving the largest vote share in the country (over 26%). Peter Black slates Welsh budget as "too timid"
“Welsh Liberal Democrats have two overriding objectives for this draft budget: to improve education funding in Wales and to re-boot the Welsh economy and provide training and hope for those without work. Sadly, this ‘bare minimum’ budget is far too timid to make the difference that Wales needs. “With just one in five children on free school meals, the poorest children, achieving 5 good GCSE’s A*-C, this budget should have taken seriously the need to close the £604 per pupil schools funding gap for children, directing extra help to the to the children that need extra help the most first. The modest increase in schools funding is welcome but does not begin to provide the kind of resources Welsh children need and deserve. “Labour continues to promote the same failed public sector programs aimed at tackling unemployment. As long as the budget ignores the need to encourage private sector jobs by incentivising employers that take on new trainees, it will fail to provide the boost the Welsh economy needs.